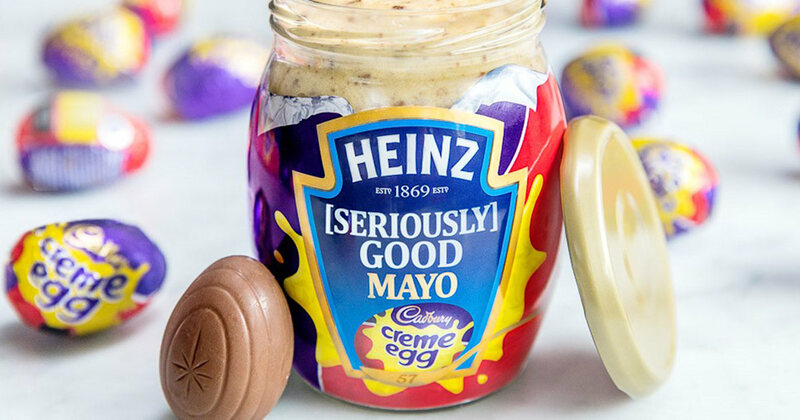 Following the successful reception of Mayochup, it would seem that Heinz has been feverishly mixing mayonnaise into all the other half-used condiment jars in the company fridge. On Tuesday, Heinz officially announced intentions to bring Mayocue and Mayomust — mayonnaise-based barbecue and mustards, respectively — to the market sometime this spring. Because it's just too hard to pick up and squeeze two bottles in stead of one. Mutt dogs are often called heinz 57s. I think these sauces need to have a canine theme in their names. Doggie dippers, pooch goop, poodle sploogle, something along that line. Mayochup and mayocue are just too effing disgusting to contemplate. Mayomust (shouldn't that be mayotard?) won't succeed because, after all, Heinz won't be using the only actual decent mayonnaise (Duke's), and who would want to yield their power to control their own mayo/mustard mixture ratio anyway? Never underestimate the sheer laziness of people today. Oh, imagine the uproar over THAT one! Mayo is bad enough without going and ruining perfectly good BBQ and Mustard. I've been putting Mayochupelish on my salads for years. It's cleverly disguised as Thousand Island dressing! But wait! You haven't heard it all yet!